Students trying to resuscitate SimMan 3G in the Pritchard Simulation Centre. 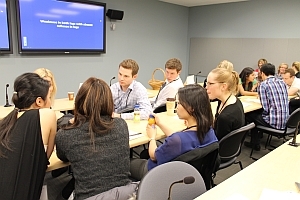 20 third-year UBC med students are currently completing rotations in Kelowna, Kamloops, Trail, and Vernon. 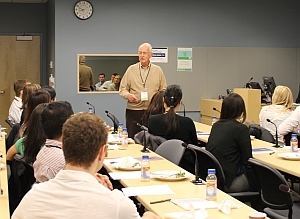 In early February, all of them were brought to the Clinical Academic Campus in Kelowna for the ‘Year 3 Clerkship Boot Camp.’ Working in teams, students were able to connect with their peers and participate in a full day of interactive learning including medical jeopardy, mock code scenarios, practicing IV starts, and airway management. Students had a chance to work with the state-of-the-art ‘SimMan 3G’ patient simulator in the Pritchard Simulation Centre. Dr. Henderson addresses the third year students. Students work on question for medical jeopardy.